Mandrake plant, Mandragora officinalis, is a plant of antiquity and many strange superstitions. Traditionally used to relieve pain and promote sleep. Known to cause strange delirium and madness. It was one of the original herbs found in a witch’s garden in Europe. Note: Very toxic. Mandrake plant is native to southern Europe and the Mediterranean and prefers well composted, well drained soils in an open, sunny position. Produces small bell shaped flowers in spring. Drought and frost tender. A perennial plant growing to 0.1m x 0.15m. 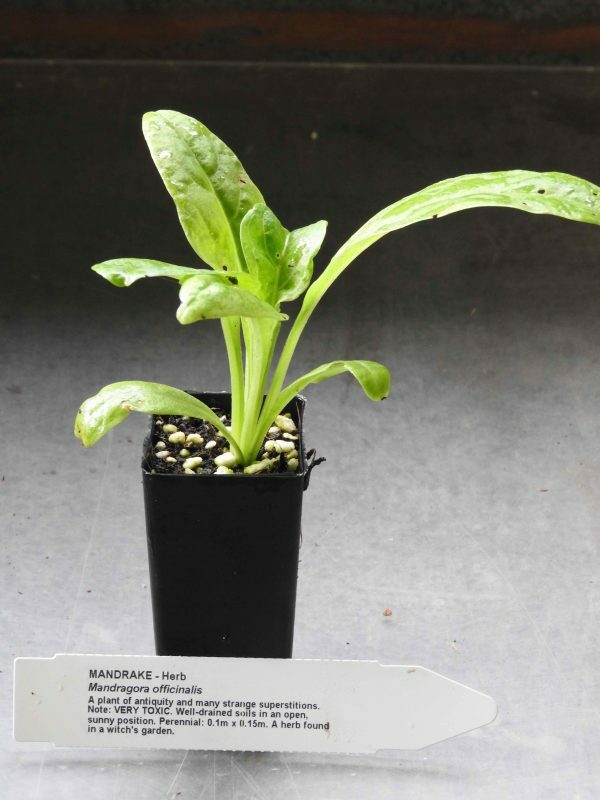 Cultivation of this species is best suited to cool temperate, alpine and semi arid areas. .
Be the first to review “Mandrake, Official plant” Click here to cancel reply.